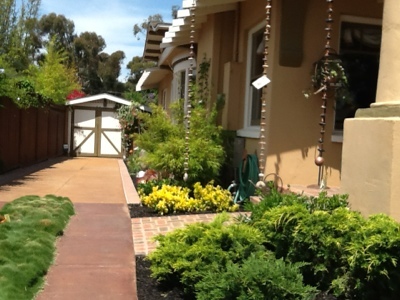 some of the garden walks I took around San Diego this year. I came home with lots of pictures of sofas, chairs and dining tables. 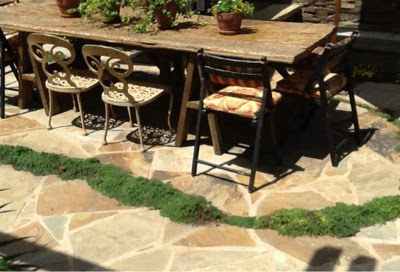 Furnishing the back yard and patio like an extension of your indoor living space is useful in a mild climate like San Diego, where we can comfortably garden and use the patio all year. 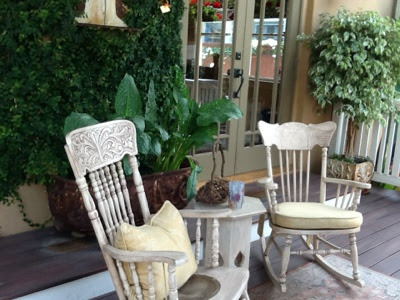 And, by way of explanation, I guess there is good reason my eyes wandered from the plants and zeroed in on furniture--since I have been considering furnishings for my own yard this year. shrubs, small trees, a water feature, a fireplace, outdoor grilling and lots of furniture--clearly designed for entertaining and relaxation. Sort of like a great room, but it's outdoors instead. and even traditional rockers on the deck. 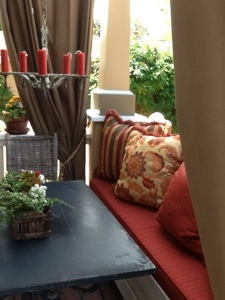 The deck also includes this banquette bench flanked with outdoor curtains. This garden has it all. And it works nicely. It is an eyeopener to see just how much you could do in a small space. 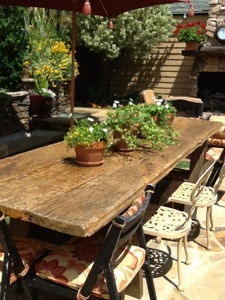 The distressed wood dining table seats ten, mismatched chairs but coordinated fabrics, and is encircled with thyme planted in between the flagstone. Hands down, this was my favorite thing on the whole tour. 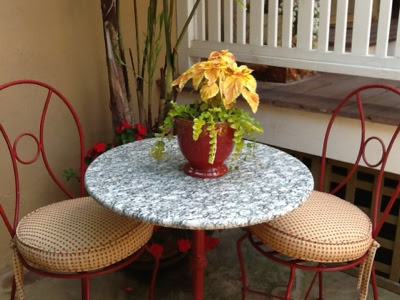 In addition to the long table, there are several bistro table sets, of various styles, tucked into small nooks throughout the garden. 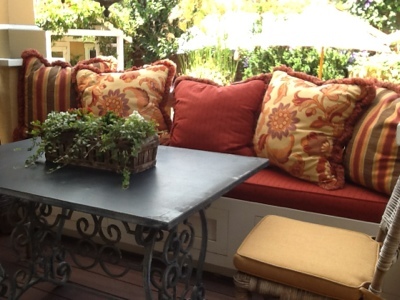 I loved the idea of adding tables for two, perfect for mingling on a smaller scale or having that morning coffee while reading your email. 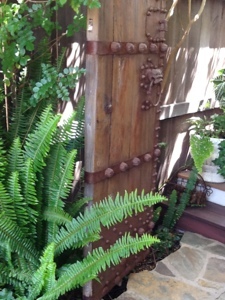 I was captivated by the gates too, both the simple wood lattice entrance covered in flowering vines and this fantastic medieval-like wood and iron door. Both make me want to see what lies beyond. Another one of my favorites on the tour is this historic, prairie-style 1916 Mission Hills home. 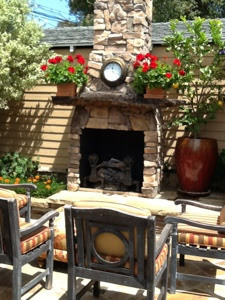 that features a contemporary yet classic fireplace and sofa grouping. 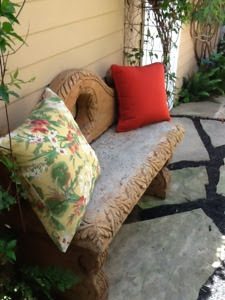 Though I usually leave garden tours inspired to be a better gardener, this tour inspired me to think about how to make my own outdoor space feel more like a comfortable indoor room. 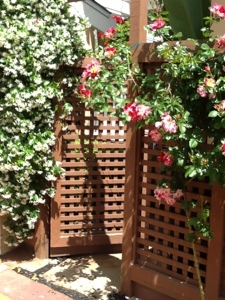 Living space where I can also enjoy my garden. Now I can't wait to redecorate! I like how intimate and comfy those spaces looked like! Estes recantos são muito bonitos e acolhedores. Bela decoração.Com bom gosto.